I think EASY should be my second name… as much as I love cooking, I need things to be easy, because of my short attention span, I get distracted and/or annoyed fast if I don’t get visible results in a short amount of time. That leads to some disastrous events in the kitchen. Like tossing whole dinner on Cookies head for example… never happened but was close. So no wonder I deliberately look for easy and fast meals. The meal I made today is one of the easier dinners I’ve made lately. 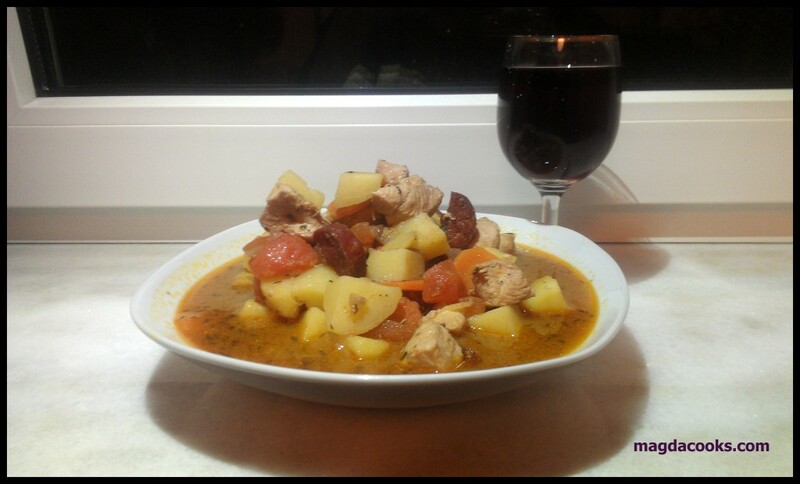 Also the mix of meats – chix and chorizo gives a delicate contrast and the veggies will fill you good. 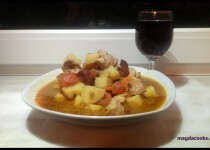 And don’t forget you just need 1 glass of red wine… yes, you can utilize the rest the favorite way, like I did. Small pleasures always count 0_o. I like to cut everything before I start cooking, so first cut chix and chorizo into similar size chunks. Chop shallots and garlic. Peel and dice potatoes, take the skin off tomatoes and dice. Cut carrots. In the deep pan heat oil, toss onion, saute for 30-40s then add garlic, saute another 20s. Add chix and chorizo, fry everything for 2-3 minutes, stirring constantly. Burned garlic is really awful. Pour red wine and scrape a little the bottom for the goodies ;-). Reduce the liquid a little, add tomatoes and bouillon. Spice with thyme, salt and freshly ground pepper. You can add a little sweet red pepper at the end. It will give pretty red tinge to the dish. Add pots and carrots and stew everything until veggies are soft and aromatic. Serve with a glass (or whole bottle) of red wine and enjoy nice dinner with your co-sleeper.